We all awoke around the same time. 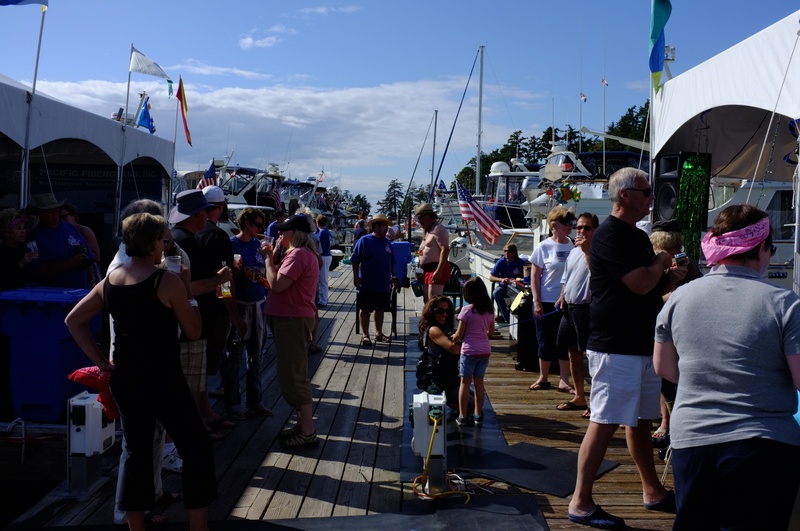 A marina is typically only as quiet as the boats moored near by and our dock was packed with countless Tollycraft fans that had been partying for days. A number were preparing to depart and we’d hear the muffled sounds of an engine starting as we started our morning routine. The day before one of us had tried the shower onboard the boat for the first time. As I’ve mentioned elsewhere, a boat magically gets smaller once you spend the night and, now, even smaller when you have to convert the head into a shower stall. Yes, it was designed to work that way. But, that doesn’t mean it’s roomy or that you won’t get a bunch of things wet. So, today we all took advantage of the public showers at the top of the marina. And, conveniently, they were located just steps away from the Lime Kiln Café where, according to a friend, we’d find yummy donuts. The cafe promotes them as world famous. Naturally, we had to try several to make sure their claim was valid. 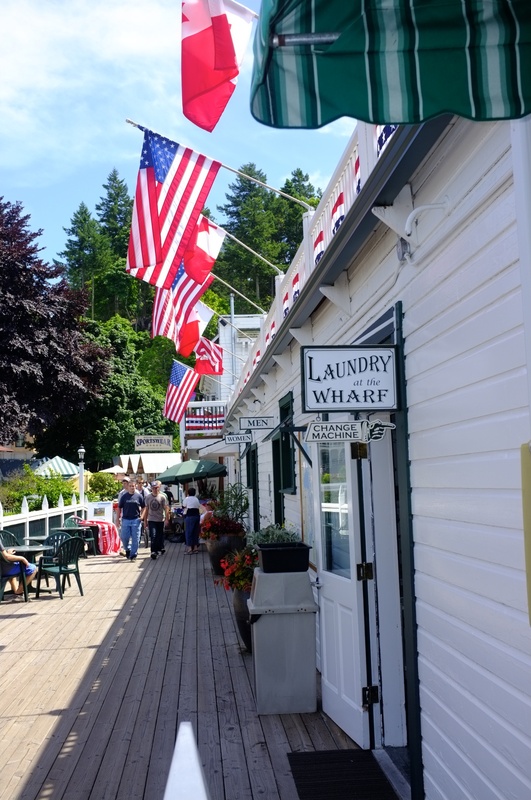 It might seem crass to move from a description of food to one of waste, but the pump-out services at Roche Harbor deserve special recognition for, well, being both efficient and clever. If you’re not familiar with what pumping out means let’s just say that when you use your boat’s head (toilet) the waste has to go somewhere. And, since it’s illegal to let it go into the water and endanger plant and animal life it goes into a holding tank. It’s probably the same for campers. Come to think of it, it’s same for airplanes (though, sometimes, they accidentally release giant, frozen masses of waste – Google it, you’ll see). Getting “stuff” out of the holding tank onboard a boat is done by sucking it out with a giant, gross vacuum. Pump-out services at Roche Harbor are, rather elegantly, handled by the M/V Phecal Phreak. 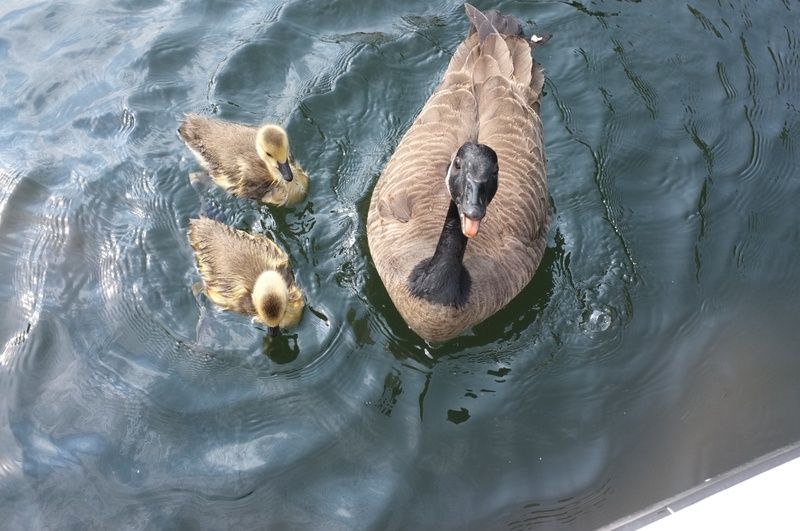 As the morning progressed we prepared to meet a friend that had traveled by boat from Seattle. The plan was to meet-up for lunch and then the crew would do a little more sightseeing/shopping. I didn’t see how that was possible since Roche Harbor was so small, but I was happy being given the task of preparing the boat for our departure. 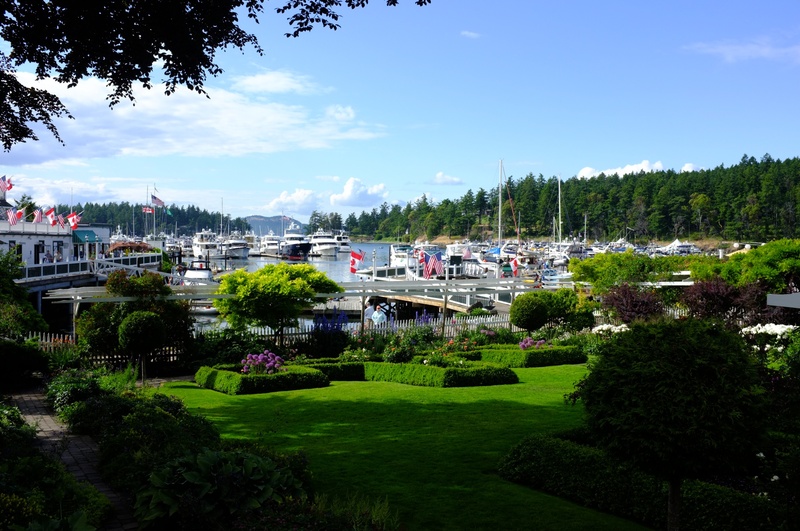 Our plan was to leave Roche Harbor in time to make High Tea at the Empress Hotel in Victoria. We were told it would take a little over an hour at our speed to make the journey. Since it’s always good to be prepared, I decided to top-off our fuel tank before heading into (drum-roll) international waters! Here’s where it gets interesting. I fueled the boat and the crew met me at the bottom of the dock. We cast off and were heading away, at marina-speed (2-4 knots) when we started hearing a really bad sound. You become familiar with the sounds your car, blender, lawn mower and, for us, boat make. And the sound we were hearing was not normal. The cynic in me suggested that it meant one thing and that starts with American Express – as in this is going to be an expensive noise. We coasted to an area away from other boats and, while the engines were running, opened the hatch and took a peek. 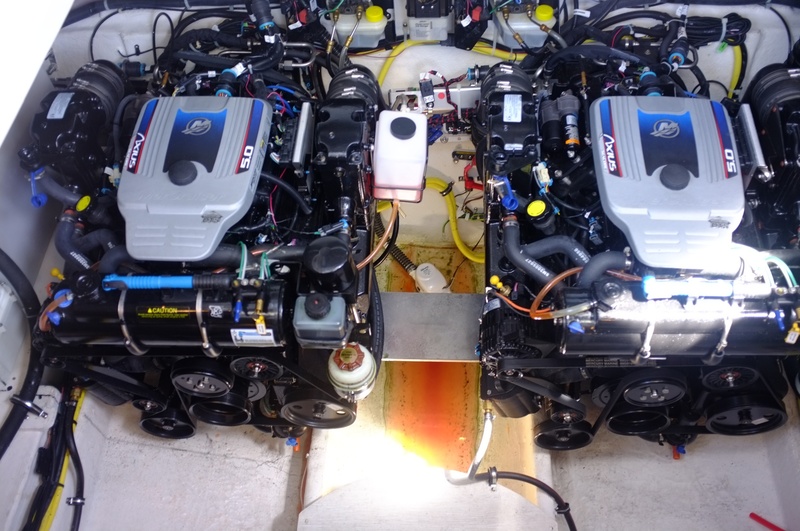 Well, the problem, though not the cause, was apparent – our starboard engine was leaking coolant fluid and the glycol was spraying onto the serpentine belt and causing it to slip, producing the sound we had been hearing. Not good. So, I powered down that engine and used the VHF to reach the harbormaster. I asked if there was a local mechanic and for a slip we could use while we figured out, specifically, what was wrong. Getting over to the new slip with one engine was easy. Docking was more difficult and after a few failed attempts due to the wind I powered up the starboard engine long enough to activate Axius and quickly maneuver into the assigned space. The mechanic showed up surprisingly fast and was able to diagnose the problem in seconds. It was a busted coolant pump. It’s not something you can just pick up anywhere and, in our case, it would have to be ordered and delivered to us at Roche Harbor. We’re on an island. We arrived by boat. We’re at the mercy of a local marine mechanic and the ability to locate the part and have it flown to where we are. Despite it being a Sunday, I was able to reach the good folks at Lake Union Sea Ray in Seattle and, remarkably, our favorite service agent was working. They’re not normally open on Sundays but had been this one day because of Demo Days. Our contact there was able to locate the pump and gasket at their Redmond location. So, the plan would be to have the part sent by one of LUSR’s staff to Kenmore Air on Lake Washington in time to make the 10:30AM flight to Roche Harbor – arriving here at noon. Installation, we were told, would take a couple of hours. Costs would run into the hundreds for the parts and service, but it would all be covered under warranty. Whether the part delivery by airplane would be covered as well would be discovered in a few days. It’s Sunday evening and we’re preparing for our third night. We were supposed to be in Victoria this evening but have remained stuck in Roche Harbor awaiting an important part. If we had to, it would be possible to limp home on one engine. But, maneuvering would be difficult and the journey slow. We discovered La Conner to be a lovely little town. The Admiral (I told you I’d start using that terminology!) enjoyed a couple of hours Saturday morning browsing the local shops while the rest of us headed to Calico Cupboard for pancakes and bacon. One of us (not me) eyed what looked like a beautiful cinnamon roll but were literally seconds late in making it our own. We watched as it was grabbed and plated for another customer just seconds before our server approached the counter. It was the last one! Apparently they’re pretty good there, and in high demand. I balanced the sad face with word that our second destination was known for fresh donuts at a placed called the Lime Kiln Café in Roche Harbor. So, we finished breakfast and headed across the street to the local bookstore. One new Judy Moody book later and we were ready to make way for our next destination. We set off from La Conner around 1:30pm heading North through the Swinomish Channel. This path can be extremely shallow and, like its Southernly entrance, demands attention and respect (unless you want to be grounded). Thankfully we left close to high tide and the normally low 6 foot depths was now a comfortable 15-18 feet. We draw only 3 1/2 feet but appreciate as much margin as nature (and the Army Corp of Engineers) can provide. Our journey toward Roche Harbor took us around the tip of Fidalgo Island West toward the Southern tip of Blakely Island where we turned North and passed between Orcas Island and Shaw Island. The weather was beautiful. Since we were going 25 knots it was difficult to take pictures. So, we stopped! We’re slowly realizing that boating life is different than regular life. When you see things that are interesting, you stop. You enjoy. It’s silly to zip past beautiful islands and bays without taking the time to enjoy them. The efficiency and speed of a fast cruiser like ours has to be balanced with moments of slow, deliberate travel. Twice on our way to Roche we slowed down, came off plane and got out on the front of the boat to enjoy the surrounding islands and water, take pictures and breathe in the fresh air. 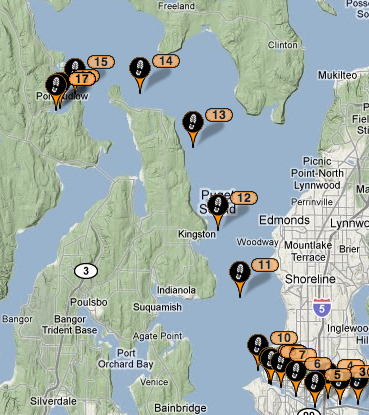 I’m beginning to appreciate the style of boating that Trawlers enjoy – slow and steady at 7-9 knots. We navigated through the Wasp Islands and several protected wildlife areas. When we passed sailboats we’d slow down considerably to reduce our fairly large wake. We entered the San Juan Channel and made the 2.5nm crossing fast, skirting around a West-to-East Ferry. Roche Harbor is at the Northerly tip of San Juan Island and we scooted into the Harbor just shy of 4:30pm. A quick radio call to the marina on 78A directed us to slip 27, which we found easily. Dock attendants were waiting for us and helped us tie up and directed us to power and water. As soon as we stepped on to the dock it was if we had been teleported to the Ozark Mountain region of Arkansas. 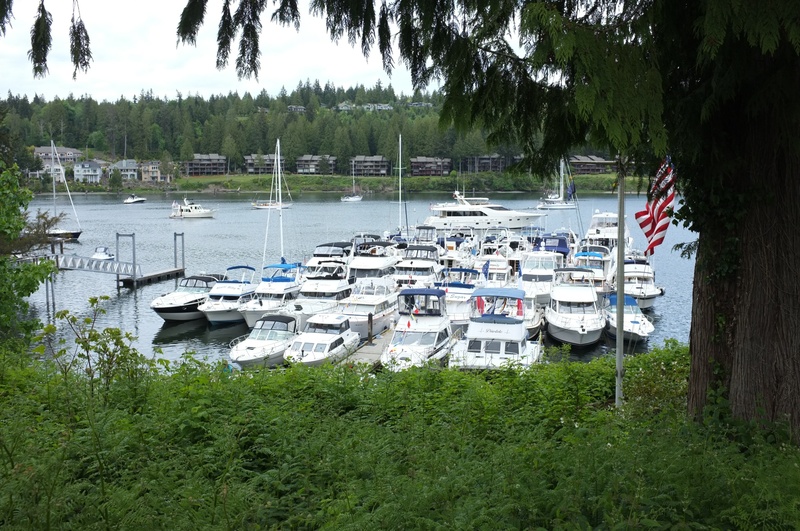 This was not what we had imagined for Roche Harbor, a boating oasis known for hosting zillion dollar mega yachts. 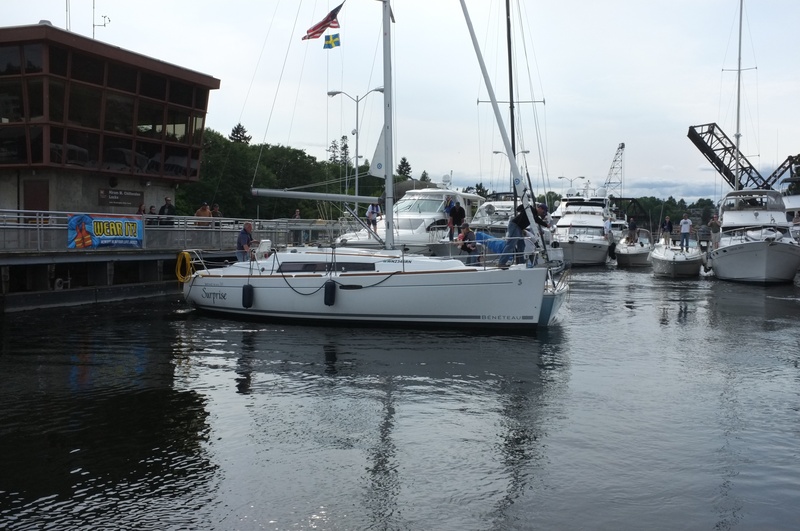 We were shocked to find laundry hanging from boat masts. There were people carrying on with accents that would make Mater from Disney’s Cars movie sound like the Elocution coach from The King’s Speech. The boat next to us was offering up fresh Possum Punch. Something was up. We discovered that we had landed smack in the middle of a Tollycraft meetup – with over a hundred boats. Apparently it’s a yearly event and this year’s theme (they have one every year) was “Red Neck.” The costumes and decorations on the boats were hilarious. They were one very festive group of boaters! 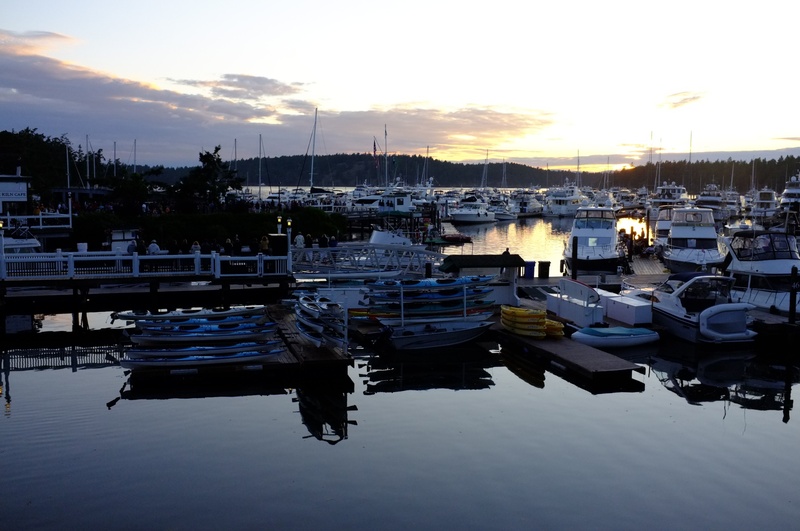 We made our way through the crowds and headed straight into the little town that is Roche Harbor. There are a few restaurants and some historic structures related to the lime works that operated here since the late 1800’s. You can learn more about the history of the town here. 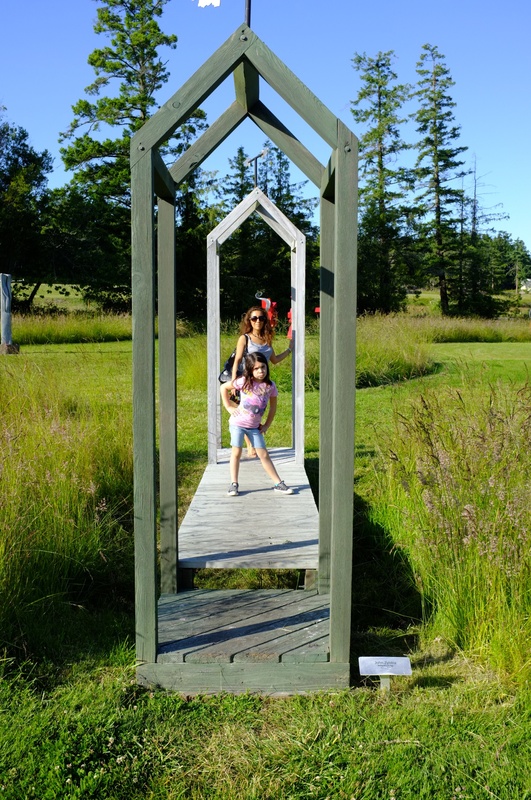 Just outside the town and only about ten minutes by foot is an outdoor sculpture garden that’s fantastic. Large, modern, beautiful pieces occupy the three acre park. We spent close to an hour walking among the pieces before heading back into town. 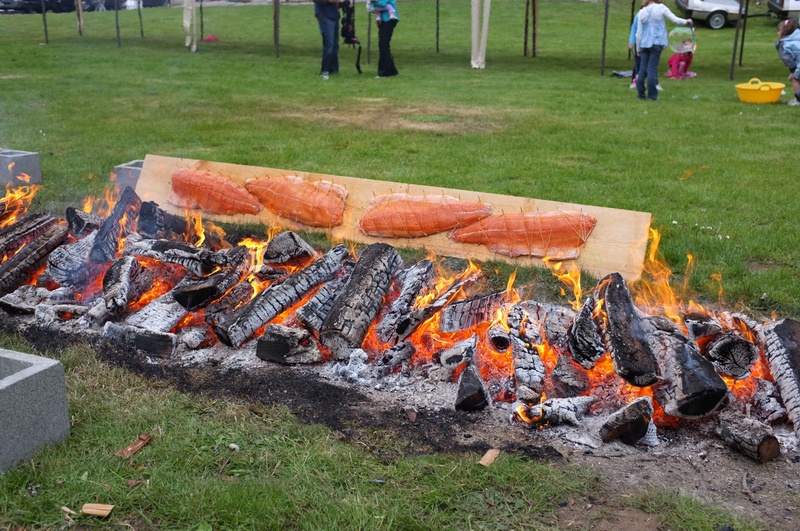 The hundreds of Tollycraft fans were being fed at a tented event across from the marina which meant we able to secure a spot for dinner at McMillin’s Dining Room. We all enjoyed the appetizers and dinner which were enhanced by a stunning sunset. In the middle of dinner the window curtains were all pulled back to expose the harbor and the Colors ceremony that takes place every evening at sunset – a tradition started in the 1950’s. Several flags are lowed ceremoniously including the Washington State flag, the Union Jack, the Canadian flag and, of course, the US flag. We strolled to the boat just as it was getting dark and prepared for bed. The planned entertainment for the evening was Akeelah and the Bee. Day 3 would bring famous donuts and a quick trip to Victoria, BC. Or, would it? We set off for La Conner yesterday just after noon. Heading from our slip into Lake Washington I decided to keep us at a very gentle 7 knots all the way until the Montlake Cut where we’d, essentially, have to remain at a no-wake speed (which for us is 5-6 knots) until we reached the locks. Going slow gave us time to prepare our cabin for our first multi-night cruise into the San Juan Islands. We reached the locks on schedule and had only a slight delay until the small lock cleared. This gave us a chance to engage Skyhook which uses GPS and the two independently controlled I/O drives to keep the LAIKA in place. Since our boat was named after our dog, Laika, I like to call this feature “Sit, Stay.” It’s a virtual anchor and it works beautifully, with an accuracy of about 9 feet in any direction (which also means it shouldn’t be engaged closed to a stationary object, like a dock). Once we turned North past Shilshoe Marina we kicked the engines into high gear and reached plane pretty quickly. For us that means we’re running about 3800 rpm and burning 24 gph. But, we’re moving fast – approximately 25 knots. Small, high frequency waves pass gently under our hull. We changed our VHF radio from 16 to the weather channel to get a forcast of wind and wave activity. Reports suggested no small craft advisories. Our route to La Conner took us past Everett into Possession Sound, left past Gedney Island and around the West side of Camino (the only way), then unto Skagit Bay. You can view our approximate course through Google Earth with this file. Most of the way we met relatively smooth water and the LAIKA skimmed beautifully toward our destination. For the first time, we activated the Garmin 740s’ ability to send turn-by-turn navigation sentences (directions) to our boat’s Axius and Vessel View system – essentially delivering an auto-pilot capability. While we had utilized an auto-heading feature many times, this was the first time we’d have the chartplotter’s course directing the boat. For safety reasons the Axius will request acknowledgement before any new turn is executed when a waypoint is reached. The first time we said “ok” we were surprised by a semi-aggressive, Miami-Vice-like turn that had us going “hold on!” After all, we were traveling at 25 knots. We discovered two things. The first is that the Axius will break down sharp turns into a series of smaller turns. After a few of these we became quite comfortable with how it was executing its turns. The second thing we learned was that it was important to very accurately chart our course and avoid dramatic directional changes. We arrived at the Western head of the Swinomish Channel and started paying extra attention to our position and the charts. According to our boating insurance agent, this area is known as the million dollar mile because of its very shallow and narrow area and two long reefs that jut out from the shore all the way to the markers sitting almost 2nm into the Bay. 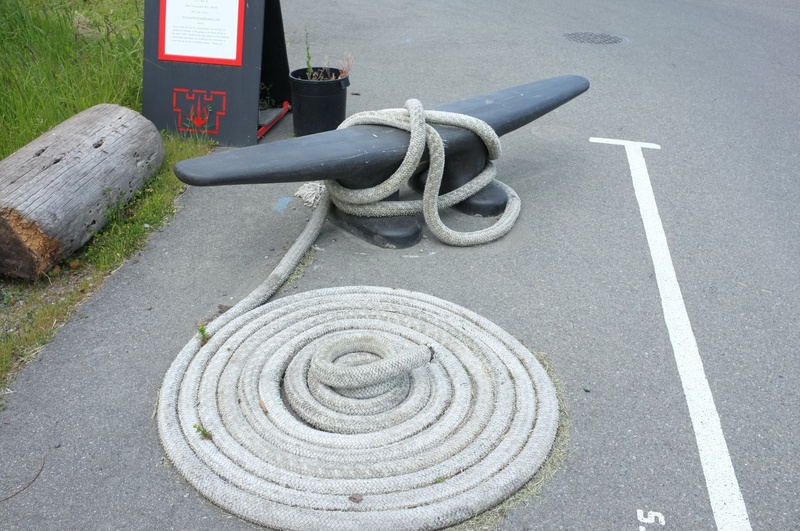 Boating in a hurry will take shortcuts and, invariably, end up requiring Vessel Assist after a grounding. We were determined not be a statistic! For dinner we went to Nell Thorn and had a fabulous meal. Highly recommended. Pleasant, attentive staff and delicious, well prepared food. Fresh Link Cod and locally grown vegetables accompanied by a Prosecco and, later, Port. 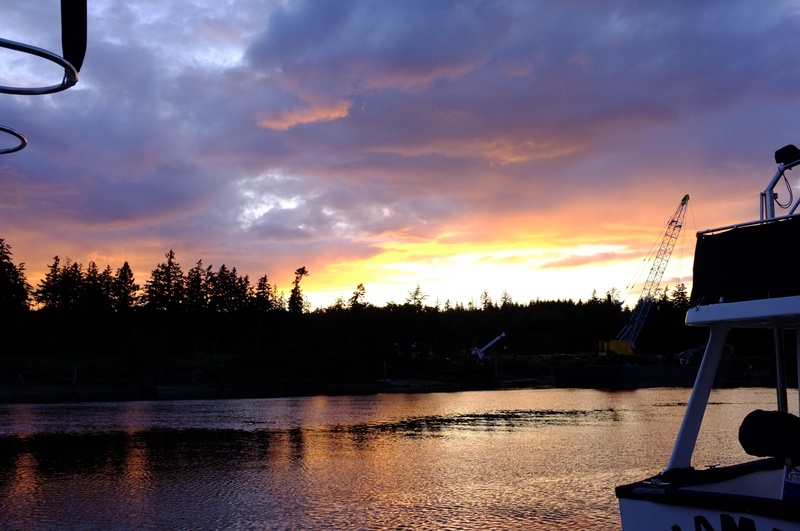 Our first night aboard for this trip (and our second night ever on the LAIKA) was uneventful and more pleasant than the first time. 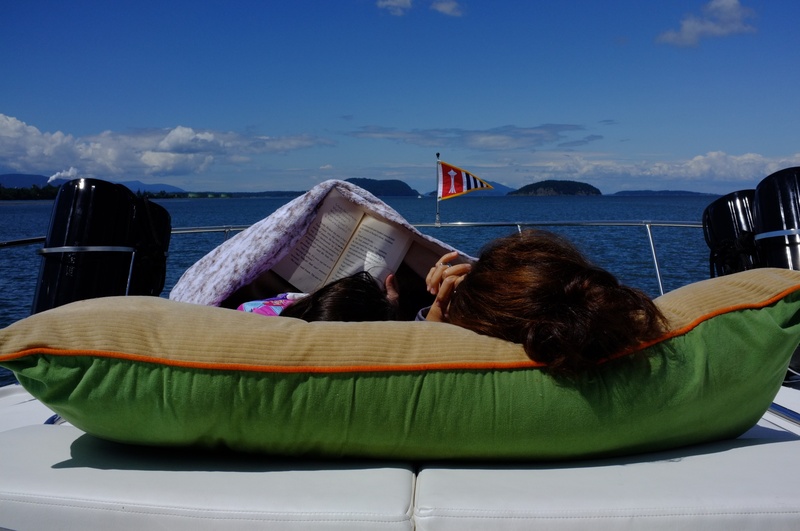 We were more comfortable with our boat and had brought from home an unused memory-foam mattress that made the master bed even more comfortable. We all slept well. 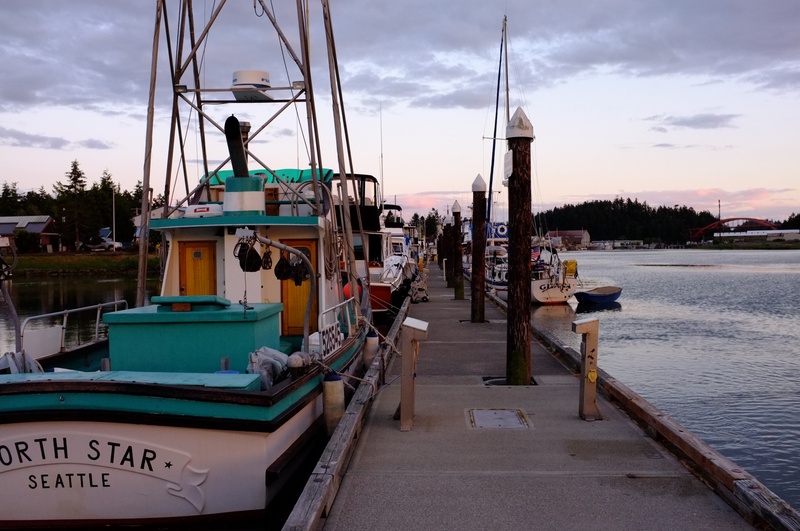 Day two will take us to Roche Harbor through the North end of Swinomish Channel. Here’s our planned route as seen with Google Earth.